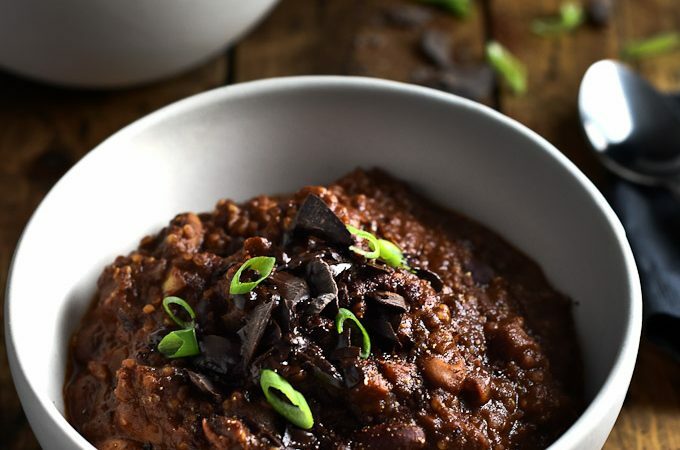 Vegetarian quinoa chili with chocolate. Oh ya, this just happened. Any idea what happens when you thrown a handful of dark chocolate into quinoa chili? Neither did I, but I had a hunch it would be a very good thing. I was not wrong. The chocolate adds a luscious creaminess to the quinoa chili and gives it a depth that is hard to explain. Have you ever had mole sauce? If you have, you'll know what I mean. You don't necessarily taste the chocolate, yet it brings something to the table. Something you can't quite put your finger on, but you know you like it. It's almost like adding salt to a dish; you may not be able to taste the salt itself, but you sure know something's missing if it's not there. You know what else makes this chocolate chili amazeballs? Quinoa. Yep, this is a 100% vegetarian chili (vegan chili, actually) that's every bit as hearty and filling as a traditional meat-based chili. While the chili cooks the quinoa swells and takes on a texture similar to ground beef. It's awesome. I have to apologize for the picture you're about to see. In the bowl of chili there's a buttery, flaky, delicious scone that's just begging to be picked up and eaten. But … I didn't include the recipe here. Please don't be mad! You see, it was my handsome man who made them, not me. He's always the one on buttery scone making duty around here. I don't know how he does it, but he seriously makes the best scones ever. They flake apart in layers, like a croissant does, but are hearty enough to scoop up delicious quinoa chili. One day I'll convince him to share the recipe. Remember when he shared his recipe for Spicy Mexican Rice with you? It happened one, so I know it can happen again. I'll get on him. If you make this Vegetarian Chocolate Quinoa Chili make sure to snap a pic and tag @theendlessmeal on Instagram so I can like and comment on your photos. I love seeing TEM recipes you create! This Quinoa Chili is 100% vegan + vegetarian and SO delicious. A small handful of dark chocolate gives it the most beautiful richness and depth. I have always wondered about chocolate in savory dishes. I also find no one say wither the coco is sweetened, semisweet or baking chocolate which is not sweetened. I’ll often use a couple different kinds of beans when I make chili. Almost always a can of red kidney beans and then usually a can of white kidney beans or pinto beans. Both are delicious! What about adding mushrooms? Would there be a reason not to add them? Would it add a weird texture? I’m not a fan of quinoa either. I guess I could add more beans? Mushrooms in chili are great! Most chili recipes are really flexible so you can add more of what you love and leave out what you don’t love. Here are a bunch of other chili recipes that I have. Some have meat in them but many are vegetarian. What size can of tomato paste? I ended up using a 6oz can. I also added a little water with the quinoa and used zucchini instead of celery. It was delicious and everyone gobbled it up. The cans I buy are 5.5 ounces so your 6oz can is perfect! I’m intrigued by this recipe. I’ll have to try it. Even though I love chocolate, I’m glad you explained you don’t taste it but rather it adds depth to it. Sounds good. I’m going to try making it with cacao. Could I use cacao powder instead of cocoa? You just put the biggest smile on my face! Thank you so much!! This looks so luscious and tasty and when I first read the title I instantly thought of mole. Pinned, great recipe! Ooooo yes!!!!! Cocoa in chili is like…one of the best!!! The flavor is just so so deep! Love it!